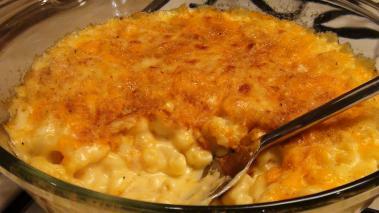 Macaroni and cheese is one of the great American comfort foods. I think every kid around loves it, and most adults do too. But I rarely see friends make it at home. That’s a shame, because it’s really pretty easy to make. In this recipe video, I make a classic mac n' cheese, or at least what I consider classic. My recipe starts with a béchamel sauce, to which I add cheese, and elbow macaroni. While you could serve it right then, I like to finish mine baked in the oven for a "baked mac n cheese", which gives it a nicely browned top. Use more sauce than you might think. As the macaroni and cheese bakes in the oven, the pasta absorbs and thickens the sauce. If you have what looks like the right consistency when you put the mac n' cheese into the oven, chances are it will be on the dry side, when it comes out of the oven – so err on the side of more, rather than less, sauce. You can see how loose I keep it in the recipe video. Use more than one type of cheese (don’t use American slices, they don’t work well) to get more complexity of flavor. And don’t be shy about experimenting with new cheeses – I usually just use up all the leftover pieces I find in the fridge. Once boiling, you can adjust the thickness of the sauce by adding more milk. You’re looking for a syrup like consistency. As you make the béchamel, cook off your elbow macaroni until al dente. As I point out in the video, this is a “classic” version of macaroni and cheese. In addition to adding different cheeses to change it up, you can add vegetables (like spinach or cauliflower) or one my favorites is to mix in some bacon lardons before you bake off the mac and cheese in the oven. Hope you enjoy this American classic!! Do you ever add salt/pepper to the mac & cheese before it goes in the oven? Or just to taste once it's on your plate? Good questions...I always prefer to season while cooking. In addition to salting the water I cook the macaroni in, see the 3'rd or 4'th bullet...when I combine the cooked pasta and the cheese sauce, I add salt and pepper. Taste it, and adjust if needed.